We all played with her when we were younger and we all wanted to be her. Barbie. She was the style icon who had all of the best jobs and the best style. It was on this day, March 9th, in 1959 when Barbie made her debut at the American Toy Fair in New York City. This year Barbie is turning 56 so let’s celebrate National Barbie Day by looking back at some of Barbie’s best looks and careers. Who could forget Barbie’s first look ever? Barbie was the first one to step on the moon, four years before Neil Armstrong did his famous moonwalk. Check out her matching boots and gloves! Malibu Barbie made her debut in 1971, becoming one of Mattel’s most famous themed Barbies. Sorry Hillary Clinton but Barbie broke barriers and had her name on the ballot before any woman Presidential candidate. This best-selling doll had beautiful hair flowing all the way from the top of her head right to her toes! She woke up like this, flawless! We wonder what Barbie has planned to conquer next? 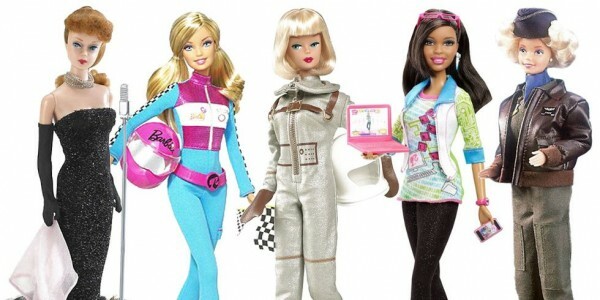 Anything is possible with Barbie. I’m jealous or would have been when I was 11 We didn’t have a lot of money when I was that age, and I remmeber we had three or four Barbies each, a few outfits, no toys. I think we bought a big used Barbie house at one point, but it wasn’t the cool pink one with accessories, and I was always jealous. Isn’t it funny what you remmeber ?